We so desperately need rain. It was well over two weeks ago that we had a good long steady rain. Almost an inch, I think. The lack of it makes me anxious. Watering the thousands of plants we have in pots from our very amazing well does the job but during times like this, we’re always concerned about its ability to sustain itself. Lately, I’ve been thinking about the things that cause stress in our lives. I am curious about how it differs from person to person. The idea of not having enough water in our well is stressful. Water is an important commodity here at the farm/nursery. I feel a twinge of frustration every time I hear the weatherman declare “another beautiful weekend…no rain in sight”. If he’s trained in weather patterns and has at least some inkling of how important rain is to the well-being of everyone and everything, don’t you think he could use his position to encourage water conservation, comment a bit on the consequences of not getting enough rain, and stop saying, “another perfect day here in the Northeast”. No, a perfect day at this point in time ( here in the Northeast) would be to have a week of days with a good steady rain! Life is not always sunny! We don’t want life to always be sunny! The weather around the world has us all concerned for too much of a good thing ( rain is good, sun is good)…but too much heat and sun with no rain dries our crops, empties wells, and drains aquifers, and too much rain floods our communities, washes away fields of grain, and can be disruptive and destructive in itself. These weather trends are not controllable, we stand aside and learn to cope. As we well know, extreme weather patterns can be disastrous. The heroes of the day are not the sun itself or the desperate need for rain, but a balance of both. It is quite obvious that across the board the weather is out of balance. Extreme appears to be the new norm. That’s not good. My plea is that the weather folks here in the northeast stop insinuating that these endless days with no rain are perfect, just what we wanted, no rain in sight. It’s annoying. Rick and I have been considering a new car. The old Subaru is tired. We’ve gone several times to look over a new purchase and consider upgrading to a vehicle with less than 190,000 miles on it and a working radio ( and a back window in the passenger seat that can actually still go up and down). The salesman told us that people consider buying a new car one of the most stressful things in life. Not for us. I can wander around the new car lot, look at the shiny hunks of metal, read the price tags, and then circle back to our scrubby maroon Subaru and think, ” aw, she’s not so bad” (we’ve done this three times already!). Stopping for an ice cream on the way home drowns out any inkling of stress from this car searching activity. We’re not bothered by it. Endless days of sun and unseasonably warm weather with no rain, that’s stressful. Buying a new car takes consideration, parting with our hard earned cash is a thoughtful process, no doubt. I guess our instinct and our points of concern really lie in the way we live our lives…at home, at the nursery, growing things and living in unison with the natural world and its events. It’s why a forecast of no rain doesn’t equate to “another beautiful, perfect and sunny day here in Maine”. Water. Water. Water. It is essential. It is lovely. It is beautiful. We need it. Would someone please call the folks who deliver our weather forecast and ask them to be fair in their assessment with regards to a “good day”, give rain and water its praise, please! Thank you. My mom called this morning,”are you still writing the blog”, she asked. I think so. I’m trying. In between getting the firewood split and stacked, the last of the tomatoes harvested and preserved, the lower sheep field bush-hogged, after another fifty bales of hay are put into the loft, once the apples are picked and made into cider, “then I’ll write a blog post”, I say. I am not the least bit put off by the lengthy Fall chore list. Each beautiful autumn day is too precious to not want to be engaged in some outdoor task. Riding the tractor through a field of tall grass ( and a bit of goldenrod and aster) on a sunny afternoon….delight. Filling baskets of apples and scrutinizing the various varieties and tastes of each…joy. Knowing the freezer will be full of stewed and roasted tomatoes…comforting. 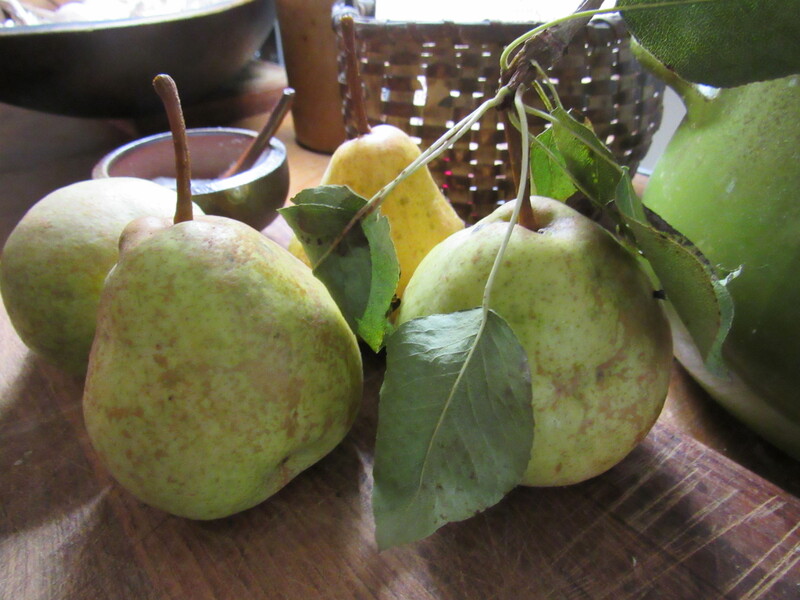 Yesterday, our friend Moe brought us some pears from his orchard. Pears are a lovely fruit, don’t you think? I’ll leave them on the table for a day or so, let them ripen some, and be happy to just look at their mottled green and tawny skin…beauty. How about a poem? Now, for me, back to work! 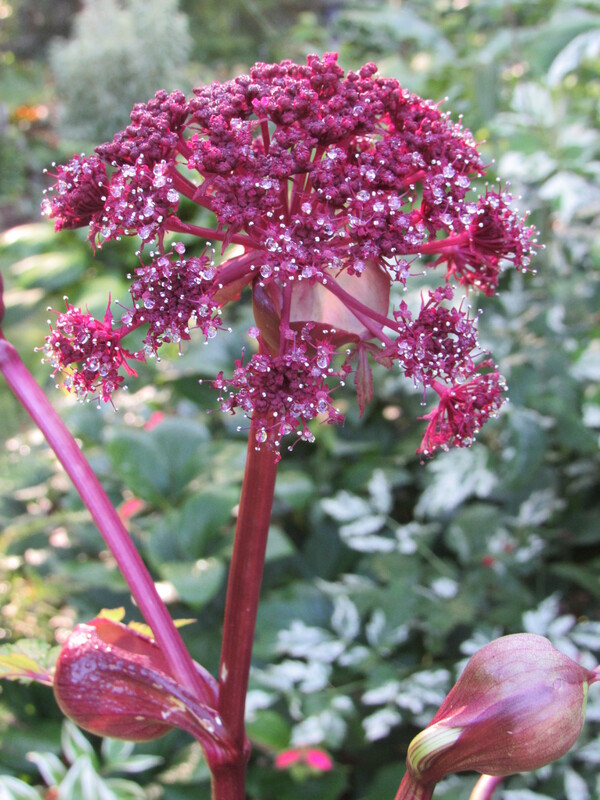 Angelica gigas, also known as Korean angelica and purple parsnip, is now in bloom, adding its wonderful colors and structure to the late summer flower period. It’s purple domed clusters attract many pollinators and are smothered in a variety of bees, wasps, hornets, flies, and beetles. Each flower, on a multiple branched stalked, is held on a reddish purple stem whose color bleeds down into the leaf. Not all of the flowers open at once, extending the show for a few weeks. Listed as a biennial, it can often be kept as a short lived perennial if the flowers are cut off before the seed is set. If left to go to seed, the seedlings are often numerous and easy to transplant. Korean angelica prefers full sun to part shade in an evenly moist soil. At 3-4 feet in height, it fits well at the back of the garden or poking up through shorter plants, although it is interesting to have it close enough to observe the insects on it. The root has been used medicinally for gynecological, cardiovascular, and immune system health. Research is being conducted for its possible anti-cancer properties. We love how well its rich color plays with the foliage on the yellow and variegated plants in the garden. As things wind down here in the gardens and at the nursery, we so appreciate the rich color and structure that Angelica gigas brings to our Fall landscape.